We take special pride in restoring your precious time-piece. I have been servicing, restoring, making custom watches since 1999 and have earned a reputation for providing excellent service to collectors and watch lovers worldwide. We offer professional repair and restoration services for Antique, vintage and modern, mid to high grade mechanical and quartz watch movements. We can custom manufacture obsolete and unobtainable parts. We also have contacts throughout the world that can custom make cases and movements for you. When a restoration is chosen, all the parts in your watch movement are meticulously de-rusted, polished and restored both mechanically and aesthetically when needed. This restoration service is more intense and time consuming than our regular overhaul services, therefore restorations are more often costly due to the time involved. Restorations are however well worth the added expense for valuable or sentimental pieces that demand the utmost attention to detail. 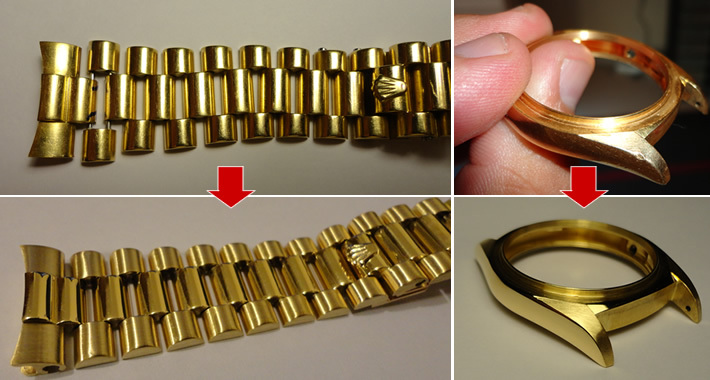 Any imperfection can be removed from your stainless steel, titanium or solid gold watch case by either polishing or dent filling with a laser welder. The process of polishing alone can take between 2-5 hours for your case and band in order to remove all small dents and scratches on full restoration projects. If the dents are too large to polish out then they can be laser-filled with the same material as the case or band and then refinished. Below are some pictures of a Rolex President case that had several dents removed and it's band that was rebuilt with solid gold. The worn out links are built up with gold tubes and solid gold rods are used the replace worn out hollow tubes. The band again looks and works like new again. We have the service available to repair broken lugs, re-plate cases and watch parts in 14 & 18 carat yellow/rose gold, rhodium and nickel. We also have the service available to laser-weld dents and rebuild any cases and bands. We can provide and install genuine and generic aftermarket dials and hands to customize your watch. We can paint or plate watch hands or markers to add color or provide greater contrast to the dial/face. © Copyright 2012-2019	Steven Burton, Cyprus.